It’s true the Tuesday night session was canceled, as you can see from the photo there was massive flooding. At this point they are planning on starting at 8am tomorrow with tonights session. Above is good samaritan Mark helping to unplug the drain as a fellow barn was flooded. Pray to the weather gods for us! bella, thanks for the live update. The pic you posted wouldn’t show up due to the mechanics of the blog. If you can email it to me I can get it up. We would all love to see what it going on. WELL FLOODING AT NORTH HAMPTON BRINGS BACK MEMORIES. WHEN MY DAUGHTER AND I SHOWED UP THERE YEARS AGO WE ALSO EXPERIENCED FLOODING. 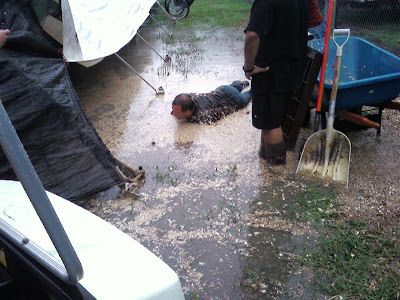 IT WAS SO BAD WE BOUGHT TRUCKLOADS OF MULCH TO PUT IN THE ISLE WAYS IN THE TENTS SO WE COULD ABSORB SOME OF THE WATER. CARS AND TRUCKS WERE COVERED WITH WATER TO THE MIDDLE OF THE TIRES. THE LOCAL STORES WERE SOLD OUT OF MUCK BOOTS. WHAT A MESS. WE WERE ABLE TO USE A WARM UP ARENA FOR THE CLASSES. GOOD LUCK NEW ENGLANDERS. I just added the photo that Bella had sent earlier. What a great shot and what a HUGE mess! Hang in there guys…hopefully it is over for the week.